It’s not a Josh Beckett blockbuster, but the Red Sox made another deal for pitching today by acquiring Cubs righthander Jermaine Van Buren for a player to be named or cash. The 25-year-old Van Buren made his major league debut with the Cubs last Aug. 31 and posted no record to go along with 3.00 ERA (2 ER/6.0 IP) in six relief appearances. He limited opponents to a .118 batting average (2 for 17). 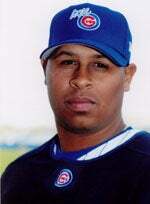 Van Buren was the Cubs’ 2005 pitcher of the year at Triple-A Iowa after posting a 1.98 ERA (12 ER/54.2 IP) and setting a franchise record with 25 saves. He combined to post a 1.92 ERA (25 ER/117.0 IP) with 47 saves in 109 minor league relief appearances since making the conversion from a starter to a reliever prior to the 2004 campaign. In 2005, the 6-foot-1, 220-pounder ranked second in the Pacific Coast League in saves and limited opponents to a .181 batting average (righthanders hit just .158). Van Buren posted a 2-3 record in 52 Triple-A relief appearances. He had 65 strikeouts in 54.2 innings, an average of 10.7 strikeouts per nine innings. Van Buren was a member of the mid-season and season-ending Pacific Coast League All-Star teams and recorded 14 saves with a 1.25 ERA (3 ER/21.2 IP) in his final 21 outings with Iowa to earn his promotion to the Cubs at the end of August. He set the Iowa franchise mark with his 23rd save on Aug. 20 vs. Memphis. Originally selected by Colorado in the second round of the 1998 Draft, Van Buren signed with the Cubs prior to the 2004 campaign and pitched exclusively as a reliever for the first time in his professional career, pitching that season at Single-A Lansing (three outings), Double-A West Tennessee (51) and Iowa (three) and combining to post a 1.88 ERA (13 ER/62.1 IP) in 57 relief outings. A native of Laurel, Miss., Van Buren is 42-36 with 47 saves and a 3.57 ERA (258 ER/651 ER) in 219 minor league appearances (93 starts). With the addition of Van Buren, the Red Sox now have 37 players on their 40-man roster.